Do you have any extra garland lying around? Than this may be the project for you! I am a garland fan, but since I didn't put any up on my Holiday "Fantel" this year, I decided to re-purpose it instead of letting it remain unused in my Christmas Decor box. This fall I scored a bunch of embroidery hoops at a yard sale, and ever since I've been gathering inspiration for projects. One idea I saw was to make greenery wreaths from embroidery hoops! Genius! First you will need to cut your garland to the desired length. I cut it a little with scissors and then just twisted it until it broke off! Next straighten it out and stretch the little branches out from the "spine" as I call it. 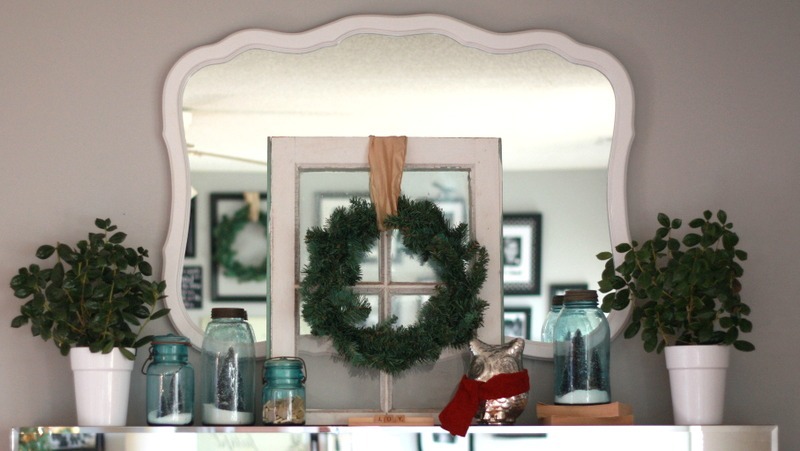 Get a piece of floral wire ready, and then lay your garland against the side of your hoop. You'll want the "spine" part to be as flat against it as you can get it. Take a piece of floral wire and wrap it around. Do this every couple of inches to secure it to the hoop. Fluff and twist the branches out to cover the hoop and voila, you are finished! Now just grab a pretty ribbon and hang it up! Wasn't that easy? =) Now you can hang it over your window, dress it up for your front door, etc.! I love re-purposing...it's so much fun to rethink items to create something new! Now,for the super fun announcement! Tomorrow we're going to have a little party! That's right, it's A Homemade Christmas Party! I hope all of you will come on over and link up any of your Christmas projects, ideas and recipes! It doesn't have to be something you posted just this year, but can be from past Christmases as well. I'm looking forward to seeing your creativity and being inspired! Hope you'll join me tomorrow! Do you like to re-purpose things? Made a wreath lately? I'd love to hear about it! Lovely wreath- your fantle looks so calm and peaceful. For the linky party, do we link up at each site, or just yours? Hi Laine. So happy to have discovered your blog! I am your newest follower. I'm not even sure how I tumbled my way to your website (LOL)...one blog just leads me to the next sometimes. Anyway, love all your ideas and Christmas inspiration. I'll be back to link up tomorrow with my handmade tote/market bag tutorial! Can't wait. What a great idea! I've had garland that hasn't been used in a few years. I usually repurpose anything I can! Love the idea! I'll be back for the link up! Thanks for sharing all you do!